We’ve told you about our favorite multivitamin, topical pain reliever, essential oil line, and supplements to support your adrenals, relieve joint pain and prevent inflammation. Now we want to introduce you to a new Wellspring Centre for Body Balance product, one that we hope will help you bring meditation and breath-work into your daily life. Love Tuner: On our chiropractic intake form we ask our patients if they practice a form of stress management, and it comes as no surprise that many of you check the “I’m too busy!” box. For those of you who feel like you can’t fit meditation into your life, our Certified Yoga Therapist Abby Hatfield has brought in a product to help make meditative breath-work an easy part of your daily routine. Abby encourages us to focus on our breath and to lengthen our exhalations to help derail our stress response and move into a place of calm. 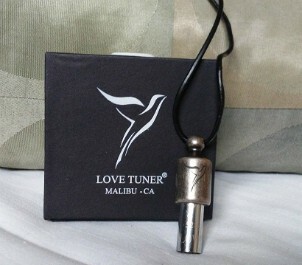 The Love Tuner is a whistle that you can carry with you around your neck or on your key chain, and in a short moment of down time, you can take it out, breathe in deeply, and blow out slowly through the whistle. The Love Tuner plays a C-note, vibrating at 528hz, the vibrational frequency of the heart. If you’ve struggled with meditation in the past, and you just can’t seem to quiet your thoughts, the sound of the Love Tuner can give you an auditory focal point to help re-direct your busy brain. We’re happy to show you how they work, just stop in and ask at the front desk.